Saw an emergency dentist and he replaced a filling for me that had come out on Friday. He was very fast and pain free, the filling was temporary but feels better than it ever felt before. I had been up all night with horrendous pain. I phoned the surgery at 8.30 am and asked for an emergency appointment. I was told to be a5 the surgery by 9am. I was at the surgery by 9 and the chair by 9.30. Considering I was an emergency appointment and didn’t have an appointment. I was treated professionally and efficiently. Am now pain free and on the list to be referred. Extremely impressed by the professionalism of all staff and service. My family have been using this surgery for 20+ years and the service is only getting better. I am so pleased I have finally found a dentist who can provide me with the excellent professional service that I receive. This dentist is a hidden gem located just of the main road in a private close, which I have now been coming to for a number of years! As soon as walk through the main door I am impressed with its cleanliness and cosy waiting area! My son loves it as they provide drawing pads and pencils to kept him occupied and a good stash of reading literature! I never have to wait to be seen and the appts never seem rushed. The dentists and nurses make me feel completely at ease take X-rays and always give my teeth a thorough clean! The receptionists are so helpful and polite and send me back with some free samples of toothpastes to use! The text message facility is a must and even when I have fun a little late I have received a polite phone call to check if I was still coming! I do recommend this practice and with their weekend opening times and extended hours mean they can accommodate around my busy work schedules! Such good value for money and impeccable oral hygiene advise! One of the best choices I have made ! "I saw this dentist recently, very good and clean. The dentists is very good and explains the options. Shows you with pictures what the treatment means so you can really understand, no other dentist explained things to me before. Very good and will recommend my family. Is very fast and pain free! "10 stars! The best dental surgery ever! All staff is so profesional, in special an amazing dental doctor. Clean, precision, efficiency, respect. Everything is so... so perfect! Thank you." "I had a fall on the way to the train station which caused me to lose the majority of two of my front teeth on impact and, having never had much dental drama in the past, was terrified that the damage was irreparable. Not only were the surgery able to fit me in within an hour of the fall, the reception staff were so reassuring and considerate, even giving me a plaster and antiseptic to treat a wound on my knee. The dentist and their assistant were decisive about what action to take and filled the gaps and, despite warning me that they would never look the same as the originals, left me astounded by the quality of the job that they did. I was then called two working days later to arrange a follow-up appointment. I was a patient in Dentist Surgery ,201 Bellegrove Road,Welling,Kent, I found here very professional staff from reception to my dentist and their assistant .I want to strongly recommend to use Dental Surgery in Welling ,Kent,Bellegrove 201.Thank you as well to the manager of the Surgery for their help. Also a big thanks from my wife C, who is a patient of one of the best dentists. " Thank you to all the staff who showed me so much care and kindness earlier this week when I needed urgent help. You were very understanding and managed to fit me in urgently and then the Dentist and Assistant were very patient and caring. Thank you all for such fantastic team service. Very grateful patient, "
" Staff are excellent and very polite. Receiving email or text before appointment is brilliant. My dentist is the best dentist I have had, very professional and keeps you inform at every point of treatment. 5 star. " "I have been coming for approx 55 years. I have seen the same dentist for approx 15 years and i can not speak highly enough of treatment,staff and whole ethos of practice is one of care and understanding.I believe surgery is a great asset to health service within this area. I would and do thoroughly recommend "
" My husband and myself had treatment recently at Bellegrove Dental Surgery and I had to write in to tell you that both the treatment and the manner in which it was given was exemplary. The professionalism and patience by the dentist was very impressive as well as the efficiency of the practice. Thank you very much to the dentist and the staff. " "There is a nice, friendly atmosphere at Bellegrove Dental Surgery. I find all the staff are caring and professional. I have been coming to the practice for many years and highly recommend it. " " With over 20 years of implant experience, my dentist gave me me the reassurance which I required. The surgery is a relaxed and friendly environment which immediately put me at ease. I was thoroughly impressed with the treatment which I received with professional patient care from start to finish. The end result surpassed my expectations and I could not recommend more. " 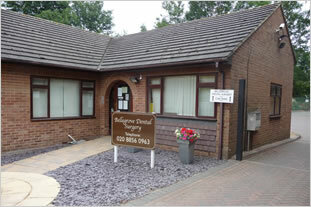 " Our family have been patients of Bellegrove Dental Surgery for over thirty years. During this time I have seen many changes, all have been to improve and extend the service and care and to keep up to date with new developments and methods in dentistry to benefit their patients. The staff are courteous, friendly and helpful, Their ability to be flexible and sympathetic whenever we have had an unexpected dental problem has been second to none. They always endeavour to fit us in, even if it has meant they have worked through their lunch break. I recently chose this surgery over others to have extensive private treatment. I received the highest standard of care, professionalism and hygiene and as I expected was very pleased with the results. I would recommend this surgery to anyone. " " The dentists are good and thorough and I feel like the girls on reception always want to help to fit you in and are kind to your problem if you have a toothache etc. I feel the dental nurses are friendly, but quiet and discreet which I like as it feels very re-assuring. " " We moved to this dentist on my mother's recommendation. We've not been disappointed. They have car park, a lovely large and clean waiting area and toilet facilities. The dentist we see is great - gives good advice about treatments and the kids teeth and I've always found them really polite. I'm so glad we made the change. " "I have been attending this Practice for a good number of years, because I have gradually been losing all my teeth. The work involved over the years has been a large number of extractions, plus the provision of dentures. I have been dealt with by the same individual every time. At one time I was terrified of dentists, but I have never been worried or anxious whilst in his chair, because this dentist is knowledgeable and professional and obviously knows what they are doing. I particularly appreciate the last few times I attended, when I had to return because my latest new denture unfortunately didn't fit 100%, and was causing me discomfort. On each occasion I was able to get an appointment almost immediately, and the problem was eventually resolved. The new denture is now so comfortable that it feels almost like my own teeth! I would have no hesitation in recommending this Practice to anybody. "